This Bhagavad Gita Quotes is a collection from various commentaries of the Bhagavad Gita. The quotes have been collected from various sources. Each of the Bhagavad Gita Quote is dedicated to the brilliant minds starting from the sages of Upanishads to the modern saints. When your intellect goes beyond the mire of delusion, you will become indifferent to what has been heard and what is yet to be heard. When your intellect, which has been confused by listening to conflicting statements, becomes fixed in equanimity, then you will be in a state of Yoga (unity). They attain the state of no return, whose impurities have been cleansed by knowledge, whose intellect and mind are ever absorbed in That (The Supreme), who remain steadfast in That, and whose sole objective is That. Fixing the mind and intellect on me (Sri Krishna) alone. If one is unable to accomplish that, by Abhyasa Yoga – one should train the mind to focus on me. If one is unable to do that, such a person should be intent on performing actions for My (Sri Krishna) sake. If it is not possible to do even that, then one should renounce the fruits of all actions and live full in the present. By following one’s duty, human being can attain highest perfection. How does man acquire this perfection by following one’s duty, listen from me (says Lord Krishna)! The divine power from which this entire universe has originated and of which the whole universe is pervaded, by worshipping that God through performance of one’s duty, man can attain perfection. See the flower, how generously it offers beauty, fragrance and honey. It gives to all, gives freely its essence. When its work is done, it falls away quietly. Try to be like the flower, unassuming despite all its qualities. It is impossible for man who has a body to abstain absolutely from all action, but whoever renounces its fruits, is the man of true renunciation. What you depend on, you get angry at. Thinking about sense objects will attach you to sense objects. Grow attached, and you become addicted; Thwart your addiction, it turns to anger. Be angry, and you confuse your mind; confuse your mind, you forget the lesson of experience; forget experience, you lose discrimination; lose discrimination, and you miss life’s only purpose – Bliss. The abstinent run away from what they desire but they carry their desires with them. 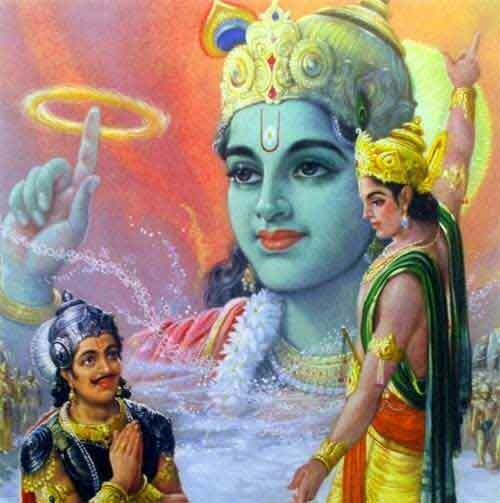 Those men who practice severe austerities not enjoined by the Shastras, given to ostentation and egoism, possessed with the power of lust and attachment, torture, senseless as they are, all the organs in the body, and Me dwelling in the body within; know them to be of Asurika resolve. Freedom is union with the deathless; the Self is the essence of all things; its creative power, called action causes the whole world to be. You are only to perform your duty without an eye on their fruits. A man must elevate himself by his own mind, not degrade himself. The mind is friend of the conditioned soul, and his enemy as well. When a man finds delight within himself and feels inner joy and contentment in himself, there is nothing more to be done. Mind is unsteady and difficult to curb but it can be controlled through practice and dispassion. Pitiful are those who are attached to their action’s fruits. The wise man lets go of all results, whether good or bad, and is focused on the action alone. When his mind has become serene by the practice of meditation, he sees the Self through the self and rests in the Self, rejoicing. The mind is, without a doubt, unsteady and difficult to curb, but it can be controlled through practice and dispassion. As though under the influence of some powerful force? Which are born out of Rajas Guna. Recognize these for they are your foe in this world. Similarly knowledge or Atman is covered by desire and lust. Therefore, it is the constant enemy of the wise man. It abides in the mind, intellect and the senses. Through them it deludes the embodied and bewilders its judgement. And hinders the realization of Atman. Action is superior to inaction. as to what is right and what is not right. Enlightened beings see all things as equal. For them there is absolutely no difference, between a learned Brahmin, a cow, an elephant, a dog or a pariah. Being absorbed in Brahman they see nothing but the Self. And having overcome all bondages, although living in this world they are one with Brahman. Their mind rests in Brahman who is Changeless and Perfect. Can there be a better dwelling place than in Brahman? The enlightened person who abides in Brahman is at peace, and without any delusions. He/She is neither elated at receiving the pleasant things, nor is he/she saddened by the unpleasant. Without desire for fruits of actions, will one be motivated to act? Intellectuals raise the question: If one does not desire the fruits of action, will he be motivated to act? brings joy and makes you free. When surrendering the fruits of actions becomes the basis of one's life, he knows nothing but giving. And at that stage further knowledge is not needed, for one has already attained the goal of life. He realizes his oneness and lives in that realization. Therefore, give up all the fruits of your actions to others and live in perennial happiness.